GCRH Chairman Bruce Eastick welcomed guests before inviting Mayor Redman to cut the ceremonial ribbon. Amongst the guests, were the first new residents, Stan & Pam Schiller who were presented with the keys to their new residence. Guests included councillors, Kevin Fischer and Bev Gidman; also locally based John Dawkins MLC, current and former GCRH Board Members and residents. It was pleasing to have the builder Mario Manno and Rotary Club of Gawler Light, President Greg Morris present. Mr Manno oversaw the refurbishment of the villa, which all present agreed, has been completed in great style. The Rotary Club of Gawler Light provided great help with the early clearing work on the site. Following the opening, guests took the opportunity to inspect the restored villa and the four new units. Morning tea and fresh scones made by Gawler CWA ladies was enjoyed by all. 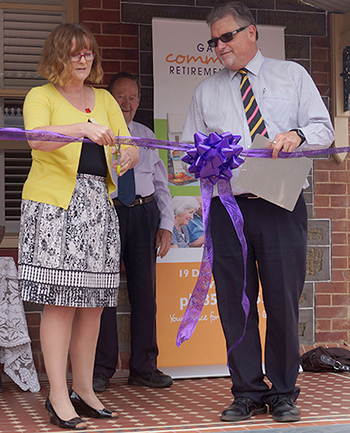 Gawler Community Retirement Homes is a not for profit organisation. It meets its financial responsibilities to the community and to residents while not losing site of the original vision of supporting low income aged persons to achieve independent living accommodation.